1. How Do I Set Up an Amazon Promo Code? 2. How can I protect my inventory from going publicly viral when running a promo? 3. When the promotion is removed or paused, are the promotional codes still valid? 4. Why Some Shoppers Don't Use Your Code? 5.How Can I Tell How Many Codes I've Sent or Have Left? We support 2 different Amazon promo codes. Multiple, one time use claim codes (recommended). Known as "one time use claim codes or promo codes” in Amazon. 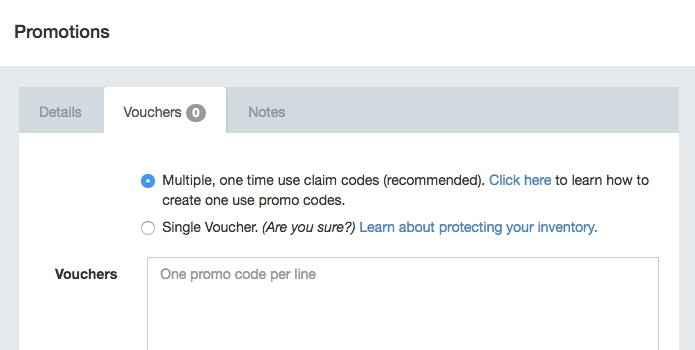 With this option each promo code can only be used one time by one person. A Single Voucher (not recommended). Known as “multi-use vouchers” in Amazon. With these promo codes ANYONE can use the code and can share the code publicly. This can cause promos to go viral causing users to run out of stock sometimes or giveaway large amounts of product for very cheap. We do not recommend using this style of promo code. We recommend you take a look at our guide, and especially closely follow the 'Single-Use Multiple Code Promo' tutorial. Video: How to create single use Amazon promo codes THIS IS SO VERY IMPORTANT. FOLLOW DIRECTIONS EXACTLY! **Sellers for Amazon.com note the following changes to Your Promo Codes. You can no longer create $OFF Codes, which means the only option you have is %OFF. This puts you at risk of having your inventory wiped out UNLESS you follow these steps to set your MAX ORDER QUANTITY. Yes, the promotional codes are still valid up until the expiry date which you set up from Amazon. So, don't worry, even if your promotion has ended, your shoppers that were issued a code, can still complete the purchase. 4. Why Some Shoppers Don't Use Your Code! We have a great thread about this in our community forum. Jump over and check it out! 5. How Can I Tell How Many Codes I've Sent or Have Left? The most important thing here is to setup your codes correctly. Always be sure to use our checklist when creating new codes. The amount of voucher codes you have left can be viewed from your Promotions edit promo window. Go to the 'Vouchers' tab. This keeps a count of the number of vouchers you have left. Subtract this from the number you started with & this will tell you how many you've issued. Just remember that when you are trying to track sales numbers, make sure you do it from the codes used, not used because sometime the shoppers don't follow through with the purchase. See the reasons here.